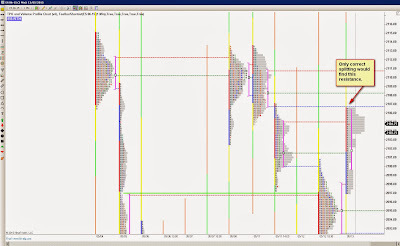 The correct splitting of the Profile showed this resistance. It was not visible before the split. I know there are lots of support and resistance areas on a chart so which one will "work". That's an easy question to answer: "the one where the order flow reverses". Support and resistance areas are decision points. Order flow makes the decision. Any progress on the book? Also I am thinking of taking Jim Dalton's upcoming intensive workshop. Any thoughts? I took Dalton's course in the 1980s. Learning more about MP is always good. Using MP as a stand alonea tool is difficult. It reminds me of the scene in Star Wars where Luke is learning to use the light sabre blind folded. Its not using all the information that is now available. 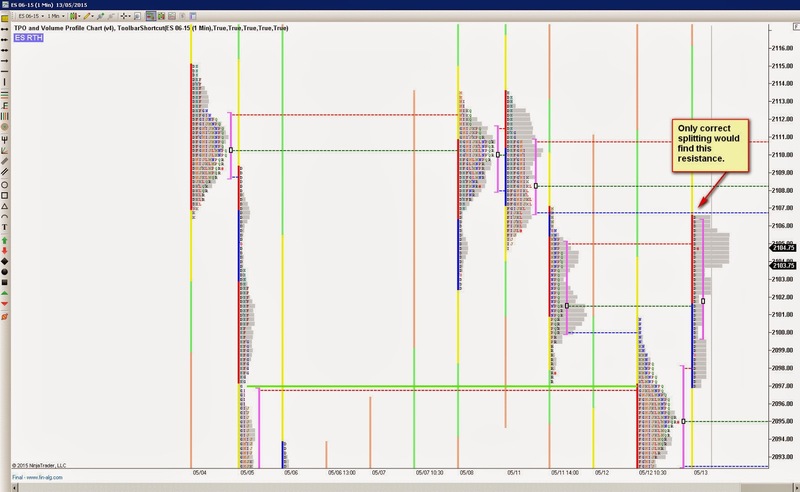 Even Steidkmayer has added volume order flow to his tool set now. Not using it is missing a great advantage we have over the traders who don't use order floe. I don't use MP, but your last sentence resonated with me. I just noticed your YouTube post. Any thoughts on doing it again (I hope so :)?